Home Opinion Harrington, Unambiguous transparency? 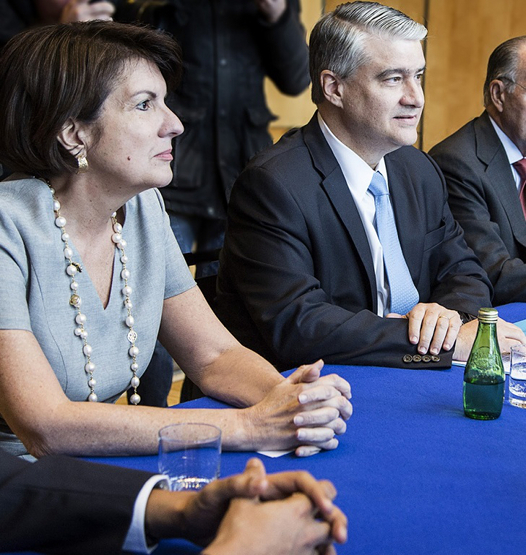 French Minister of Finance Michel Sapin and Panamanian Minister of Economy and Finance Dulcidio De La Guardia met in Paris on April 25. Both governments sounded upbeat about exchanging information but few details were offered. Photo by the Ministry of Foreign Relations. To an open government activist, it is a perverse godsend that the “Varela Papers” have focused (unprecedented) global coverage on a country whose truly-significant problems have historically been resolved from abroad. As media groups profit from a relationship with government in any closely-knit society, value is added by the flow of information enhanced by foreign journalists on the ground. Thomas Jefferson’s dictum about preferring newspapers to governments simply does not make sense here, because in Panama newspapers ARE governments. Two years into president Juan Carlos Varela’s five-year term his inability to deliver even the most basic services — those dealing with public health which made the Canal possible in our tropical environment — can be actually seen in the garbage piling up on empty lots and in natural rainwater drainage courses, not to mention the many communities blocking roads all over the country, to draw attention to deficits in drinking water. What it most evident otherwise is the breakdown of the rule of law. Corruption is rife, and only lip service is paid to the existing sunshine legislation designed to minimize it. That was evident this week. By law, interim progress reports on the Panama Canal expansion should have been submitted on the floor of the National Assembly. It was, nonetheless, delivered to a select committee hearing. The difference is simple but significant: full sessions are broadcast nationwide on live radio and television — the committee hearings are not. The public is thus woefully underinformed as to the workings of its country hallmark asset. Despite existing legislation. But at least such things are visible. As the French have now found with many other things, the real harm is mostly invisible. Case in point is US Ambassador John Feeley’s interview in La Prensa on April 24, 2016. Tantamount to a political endorsement, this came hard on the heels of a Dichter & Neira (April 19) poll, documenting a slide in Mr. Varela’s approval rating persistent since February – long before his mismanagement of the offshore fracas. Surprisingly, 78 percent carried a negative opinion about his transparency. The president virtually-assumed ownership of the papers on April 4 (by declaring his close personal relationship to the mentioned law firm). Despite a professional offshore damage control consultancy, Varela’s lack of judgement was highlighted in dissembling about that relationship in The New York Times on April 11. He wrote: “this particular trove of documents came from a single law firm based in Panama.” In the event he overlooked disclosing that Mossack & Fonseca was no run of the mill firm. From the onset of his administration, Mr. Ramón Fonseca had sat in cabinet as a duly appointed minister-without-portfolio — and thus privy to policy debated behind closed doors — to the exclusion of 20,000 other Panamian lawyers, with less colorful client portfolios. And this, without implying any malfeasance whatever, affords at least the appearance of a conflict of interest (which should not have been overlooked on his appointment). In denial facing mounting international media coverage, the President traveled to receive an orchid named after him (“Dendrobium Juan Carlos and Lorena Varela”) presented by the world-class Singapore Botanical Garden. During his absence, ambassador Feeley went public. Only recently arrived, Mr. Feeley is attempting to fit the “campechano” persona of an earlier ambassador, Joseph S. Farland, who rolled up his sleeves and left Panama City´s diplomatic circles to make his personality felt in every corner of the country, in implementing John F. Kennedy’s “Alliance for Progress.” It is held that the 1964 riots might not have materialized, had Republican Farland not been hounded out by President Lyndon B. Johnson’s Foggy Bottom. But those were other times, and Feeley’s La Prensa timing was not a good idea. Sensitivities to meddling when Panamanians sort out their problems are reflected in an idiom acknowledging “los verdaderos dueños del circo”. Although Mr. Ambassador is indeed to be congratulated for going out on a limb, calling for the level playing fields amongst corporate services industries in Panama, Nevada, Wyoming, and Delaware (just ahead of the new dump of documents scheduled for May 9). He had hinted at this notion generally in his maiden speech in Panama, so specifying these specific states is welcome. Albeit achieving them is well beyond his remit. Not so, another tranche on his mission statement: “expandir la prosperidad de Panamá y EU, al explotar nuestros acuerdos del Tratado de Promoción Comercial”. This hard to swallow. Embassy statistics show how in FY 2015 Panama imported 19 times more physical goods by value, than it exported to the United States, and Panama will forego some $300 million in customs revenue annually. That could pick up a lot of garbage. The ambassador does no one any favors by repeatedly referring to his “commitment to transparency,” as President Varela has not even approved structuring it, even on his watch. “It’s a fact in the Library of Congress,” that to date our Transparency Law has no implementing bylaws — none whatsoever. Despite a law has been on the books since 2001, it gave rise recently to two diametrically opposed Supreme Court rulings. Truly mindboggling – even by Panama standards. The one same set of nine magistrates unanimously granted a writ of mandamus on a FOIA request. But they unanimously denied another. Both requests were identical and submitted on the very same dates. The only difference was that one petitioned the Minister of the Presidency, the other the Minister of Public Security. Both ministries had failed to comply within the 30-day timeframe mandated by the Constitution itself. The presidency was left inured. To his credit, Minister of Public Security Rodolfo Aguilera Franceschi complied with the mandamus against him in a proper and timely fashion. Varela and his offshore crisis will pass. But it is institutions which must endure in order for a country to survive.